One of my goals for the year is to spend about one hour each week reading a professional educational blog or two. Unfortunately I have not been too successful to allocate time for this, but have been reading snippets here and there. I enjoyed the time last night and this morning reading through my MDTA cohort's recent posts (see links on the left of my blog), and a few posts I found on Twitter. 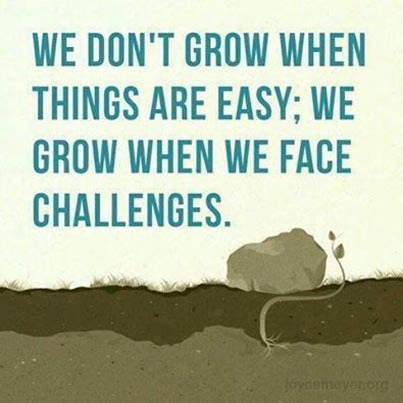 Two which stood out to me were about challenges and student reflection. After reading Christina Polatajko's blogpost about challenges in the classroom, Joey Feith's blogpost about student reflection tied in nicely this morning. These are two parts of my teaching and learning I am trying hard to work on. I had the realisation after reading through some of my students blog posts (such as Pote, Taunese, Mary, and Melissa) that I possibly need to challenge some students a little more. As I am sure all teachers do, I have the odd student or two who speed through their tasks and want/need more. I have blogged before about the need to extend my extension class, but there are also kids in every other class I need to extend too. I need to have more confidence in some of my students and give them challenges I am uncertain whether they will meet. Like Christina, I may be pleasantly surprised, or students may not be entirely successful, which is another learning curve itself. Students reflecting on their successes, and the things they are yet to succeed enables a breakdown of 'where to from here'. As Joey discusses, PE teachers can sometimes forget about the importance of taking the time to reflect on learning, particularly when faced with challenges. My challenge recently has been to provide time for students to reflect on their tasks, to think about what they are really taking away as they leave. I am still trying to find a way to formalise this though, maybe blogposts or a Google Form. I value reflection, so I bet many students do too. Firstly, great to seeing your kids blogging :) Awesome work on setting that up! I wouldn't be too hard on yourself for not committing time to reading as much as you would like as it reads from this post that you are picking up some valuable insights from the snippets that you are reading! I like your thinking on how to incorporate reflection formally into your practice as this is something I am working on also (as well as in preparation for my dissertation!). Will have to pick your thoughts over the next couple of weeks! Thanks Heath - trying hard to include blogging within lessons, but it's hard to do so without it feeling rushed. Reflecting helps with progression I think, hence why I value it and want to give myself, and my students more time to reflect. We have so many pressures of content and achievement, but sometimes we need to actually just stop and think!